Written by Emmy-nominated writer and director Kevin Toolis. 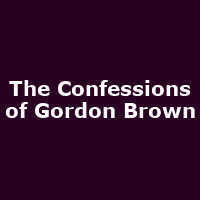 "The Confessions of Gordon Brown hilariously exposes the darkest secrets of being Prime Minister, the stab-in-the-back plottings, the betrayals and most importantly - the hair gel. Love him or loathe him, Gordon Brown was our greatest failure at being Prime Minister in 200 years. In a candid portrait of life inside Downing Street Gordon at last reveals what it takes to knife your way to the top and rule a nation. And how his dream of power all went wrong."